Written by Caroline Collins, M. Ed. This is part I of a series of articles which will explore the multitude of benefits of natural foods for athletic performance. This article focused on Endurance, later topics will be Recovery, Clarity & Focus, and Rest & Detoxification. Oftentimes, the simplest foods are the best foods for overall health and body performance. Current trends push synthetic, expensive supplements and foods for athletic performance. The purpose of this article is to educate readers how natural foods, specific ingredients used in CC’s Granola, benefit athletic endurance. The first time I held significance to this quote was during my undergraduate years while studying nutritional sciences. Studying the science behind nutrition and the physiological processes of the body gave meaning to this quote and influenced my passion for wanting to share my love of nutritious and delicious food. The body is designed by nature, so it makes sense that it operates best when nourished with foods also made by nature. Let’s take a look at 3 superfoods used in CC’s Granola which increase athletic endurance and performance. Do you ever find yourself out of breath or have difficulty controlling your heart rate while exercising? Your body may be in need of Iron, an essential mineral used by your red blood cells to deliver oxygen from the air you inhale to all places of your body, most importantly for athletes: muscle tissues. The hemoglobin molecule, pictured above in the red blood cell, is made up of Iron. In order for oxygen to bind to the red blood cell, we need to have iron present in our blood. 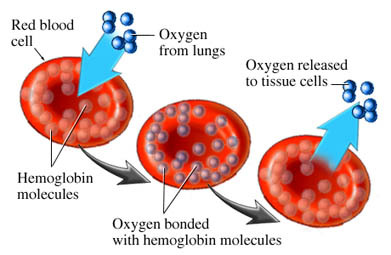 Hence, the more Iron we consume, the better our red blood cells will be for doing their job in delivering oxygen. Without enough iron in the blood, the faster you will become fatigued. Pepita seeds are a great source of plant-based iron, as well as being high in fiber and protein. These superfood nuts have the dual benefit of combating mental and physical stresses on your body. Our minds are just as important to keeping in shape as our bodies, so keeping mental health is also needed for an athlete’s success. According to a study published in the Journal of the American College of Nutrition, consumption of walnuts on a regular basis reduced blood pressure in response to stress. How does this benefit an athlete? As an athlete and active competitor, I know the experience of preparing for a competition or fight. Worries and negative thoughts can loom in the brain, so reduce the anxiety by having your walnuts. Along with reducing stress, walnuts are packed with antioxidants. Antioxidants are your body’s protection from free radical damage, which is responsible for the effects of aging on both your body and mind. Intense training brings on even more free radical damage. Walnuts help reduce this effect by reducing the inflammation, allowing for more efficient body processes. Walnuts are also packed with energy boosting B and E Vitamins. Get nutty with your Walnuts, your body will be happy. Waiting in the bullpen before your fight, you may have seen empty honey packets thrown on the ground. While it is irritating that people are irresponsible for their trash, it is good to know they are being responsible for their performance. According to findings presented at the annual Experimental Biology conference, honey delivers a significant boost to athletes during strenuous exercise. “Our first study suggested honey could operate as a time release muscle fuel for exercise. Our second experiment suggested that honey would be a good carbohydrate source to replenish muscles. However, our last study convinced us that honey can improve endurance exercise capacity,” concluded Dr. Kreider of the University of Memphis Exercise and Sport Nutrition Laboratory. Honey is a natural sweetener and is easily and quickly digested by your body. Taking it before vigorous exercises can benefit performance, and studies have shown it to be the more effective carbohydrate for endurance athletes. -Caroline Collins is the owner & founder of CC’s Granola, an athlete for Cobrinha Brazilian Jiu-Jitsu, and a Science Educator. Older PostExclusive Access to Brazilian Jiu Jitsu for Kids!